Every year, you see me and every other food writer in town urging you to dole out hundreds of dollars to attend Chef's Gala, a food-centered fundraiser for Heart of Florida United Way. What on earth, really, can justify spending $325 per person, or $600 for two, for one evening out? You can join Delicious Disney. Simply sign up. It's new, and it's ambitious, and it involves eating extraordinarily well at Disney World. Let me explain. A few months ago, Disney World's top chefs – the heads of the signature restaurants and the bigwigs in the Flavor Lab – put together Delicious Disney, A Chef Series. The goal: to bring guests who are at once Disney and food enthusiasts together with the kitchen artists behind Lake Buena Vista's most noteworthy meals. For Delicious Disney, each meal has a theme, and each dish is tied to an element of that theme. The series kicked off in 2016 and has several events so far in 2017. I was lucky enough to participate in Walk Around the World with Disney. Here's how it played out. 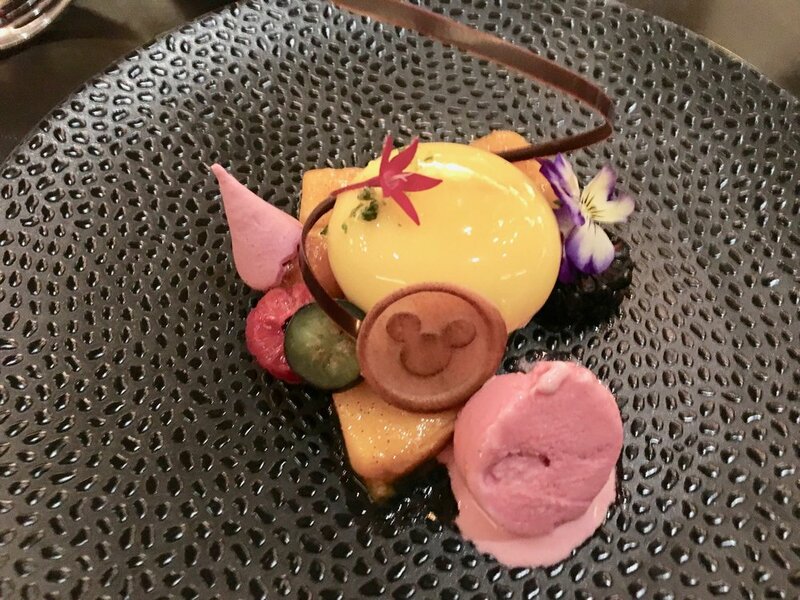 This Delicious Disney dinner was held in the warm and elegant Markham's Restaurant, the exclusive eatery in the private Summerhouse clubhouse at Golden Oak, a high-end residential community located on Disney property. The evening began with a signature cocktail plus pass-around hors d'oeuvres that were upscale twists on theme park foods. For example, a corn dog on a stick, like those sold on Disneyland's Main Street, were here made with a fine German sausage in a natural casing. It was an ironic twist in a room filled with gentlemen wearing jackets and ladies in cocktail dresses. Promptly at 7, guests were escorted into the main dining room. The room is a lovely space with vaulted brick ceilings, tufted red leather banquettes and classic lamps, all in view of the open kitchen. A long rectangular menu was at each seat. One one side, the menu showed the Disney castles around the world featured with each course. On the flip side was each of the seven menu items tied to the castle. The wines paired to each course were written out too. As each course was served, a chef described it in detail. Then Master Sommelier Brian Koziol talked about each wine. The chefs and Koziol also visited with tables throughout the meal. Seven courses later, guests received one final gift: the same colorful, informative menu again, this time signed by each of the chefs above castle representing the course he or she created. Two more Delicious Disney events are on the calendar for 2017: A Culinary Tribute to Mickey Mouse's Birthday at the Contemporary Resort's California Grill (November 18); and a Farm-to-Table repast on a tree farm (December 6; a few seats left). The meals are not inexpensive: Prices range from $199 to $499 per person, per event. These are legitimately what you'd call gourmet dinners though. They're prepared by experienced chefs, made with luxury foods, and paired with exquisite wines. And, the groups are intimate, with no more than 60 diners total. For food details on my meals, hover your curser over each photo for descriptions. If you'd like to join either of the last two 2017 Delicious Disney dinners, call 407-939-5773 between 9am and 5pm to make a reservation. I'm told these fill up quickly, so don't dally. If you can't make it this year, stay tuned. The Delicious Disney chefs are already buzzing with ideas for a Star Wars-themed dinner when the space-themed land debuts at Disney's Hollywood Studios in 2018. Let's hope the Delicious Disney, A Chef Series stays around that long, because a Star Wars-themed dinner would be out of this world. About a fourth of my work involves this: telling readers how to get the most for their money in Orlando. One of the always-valid tips involves choosing hotels that are on Disney World property but owned by others. Today's feature: Hilton Orlando Buena Vista Palace.